I cut off my arms, my legs, and cashed in my IRA. Okay kids, now we’re ready to experience the magic that is Disneyland. It is a one-of-kind thematic landscape, home of Tinker Bell, Dumbo, even the late Michael Jackson has an attraction. I wanted to take my two boys before they were teenagers, anticipating a challenge even though they might seem an ideal age. My ten-year-old, a thrill seeker of the scariest roller coasters, and my seven-year-old, a more gentle spirit, are at complete extremes. No matter, I knew Disneyland would be special, and I was curious how their experience would stack up to my e-ticket, childhood memories. Naturally, lines are part of this magical experience. A line awaits you to secure entrance into the park, followed by lines for photos with princesses and photos of your family…you get the idea. There are hoards of people and moments when it is best to attempt a zen space and wait until traffic passes. But fear not, at Disneyland everything is a matter of minutes. Hours…you can do the math if you like. Lots of standing, lots! Your legs feel like magic by the end. I’m not kidding. If you are organized enough to download a trusty phone app that forecasts the wait times of popular rides, you believe that you are savvy. In reality, the phone app is highly inaccurate, with the actual wait times usually being less than stated. This, I can live with. Don’t despair. It’s only 85 more minutes, not 110. It will be a snap! Our first ride was the Pirates of Caribbean, one of my all time favs! My seven-year-old fought it the whole way, dragged through the line against his wishes. I was so certain he would think it magical. 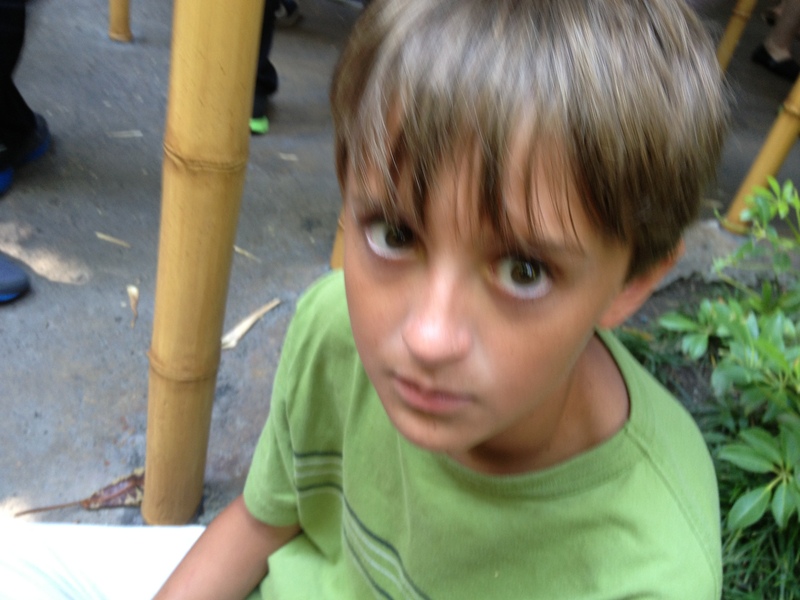 He managed to sit through the entire ride…if he didn’t he would have thrown himself into the swampy bayou. In the end, he stated, “I hated it.” Perhaps, he didn’t like all the periods of complete darkness. Yes, it is a dark ride. What Disneyland lacks in daring drops and backward loops of say more generic “scary” roller coasters, it more than makes up for in atmosphere, in theme, in song, in presentation. 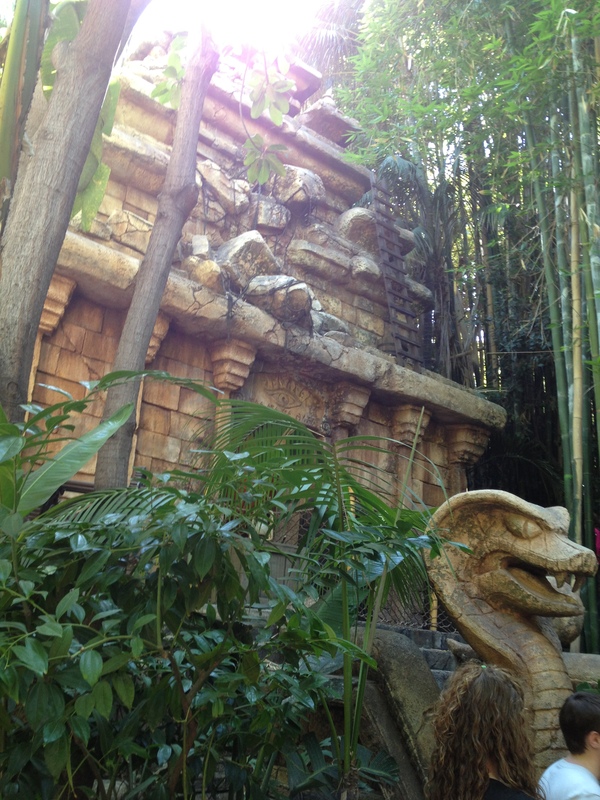 Just look at this Indiana Jones Temple surrounded by magnificent bamboo. As you go down, down, deeper into the temple, you’ve lost all perspective of how long the line is, wrapping around and around. How’s that for enchantment? Many of the big rides are built into some kind of mountain with dark tunnels. This is probably why my youngest opted for lighter offerings, such as the Monorail and It’s a Small World, eschewing the Fantasyland characters of Peter Pan and Alice in Wonderland, much to my disappointment. After my oldest son rode It’s a Small World, he developed pediophobia, a fear of dolls. My seven-year, old, languishing in this new knowledge, taunted his older brother by singing “It’s a Small World” in his presence every chance he got. 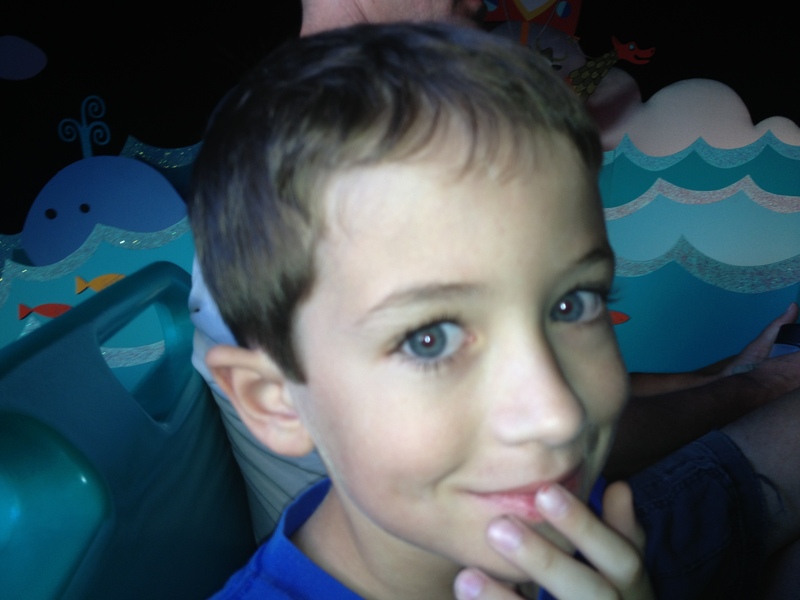 My younger son on It’s a Small World. Is this little boy not filled with magic? After five times on this ride (only a ten minute wait! ), I noticed that not all of these dolls are created equal in this small world. Some do not have moving faces, and some are, indeed, still. A few looked like place holders for what I’m sure would be the real “moving, automaton doll” at a later date. The giant, purple panda? Perhaps, a school project. Woody and Jesse? Really? I mean, aren’t they like cash cows for you, Disney? Does Toy Story ring a bell? I know it’s not a shortage of funds or time. My ticket could probably pay for a doll with moving parts and it could be swapped out in no time. 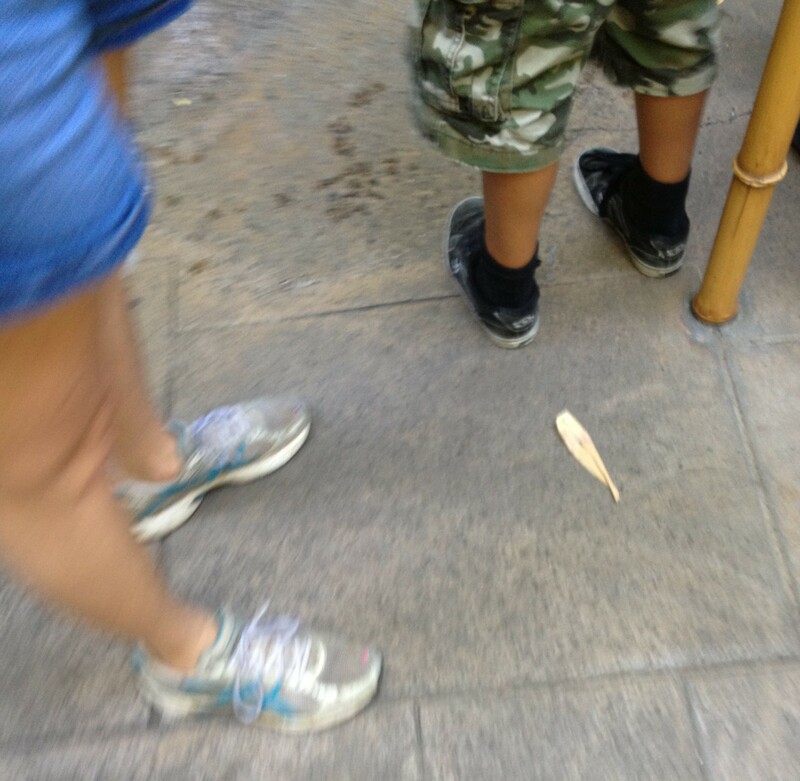 This is the closest we got to Mickey…we waited and waited, like forever, at his house. The real Disney magic is its employees, who make it the happiest place on earth, always service with a smile. This is even true for the clean-up crew, white-clothed and white-gloved. I’ve seen them up close and personal. Friends, on our last ride, the glorious Splash Mountain, we had a fast pass that allowed us to sail through plentiful minutes worth of wait time. See you suckers! Yeah, we’re organized. We organized our whole day around it, in fact. Throughout the ride, my sister exclaimed over and over, “This is torture, torture, TORTURE,” because she was a wee bit frightened. Oh, she had no idea. My stomach was tossing and turning, I thought I might heave before I had even got on the ride. You know that feeling before you know you’re to be sick; you convince yourself otherwise. With each passing minute, you tell yourself, you’re farther away from the possibility of sickness. I’m better, I feel better. Definitely not now, knowing full well, it’s going to happen. Oh, yes! But not on this ride…I made it through the singing chickens, rabbits, frogs, whatever they were, the bumping boats, the bursts of mist…or maybe I had lost it by then. Once off the ride, I made a beeline to the shuttle bus, and sat down for twenty seconds, before the moment had arrived. I ran outside and threw up all my stomach’s contents by a trash can. It was violent, wretched, painful even, and went on far too long, so long, that a Disney employee was there waiting to clean up before I was even finished. This is high on their list of priorities. My sister consoled me, telling me, “Everyone on the bus was so concerned about you.” My husband corrected her, “No. They were horrified.” My son, in fact, came to either comfort or witness the act, and ran off with his mouth covered, “Oh, my God.” I spared you a picture, as I was not in the mood to take one. The next day, I saw the same dedication of Disney staff when a little girl barfed outside the Pirates ride. This is behind the scenes magic, cleansed and disinfected before you ever knew such vileness touched the surface. When my sister fell on the train tracks, the white-clothed arrived in a heartbeat, offering an ice pack. Personally, I think my sister should have asked for an ice cream cone, one of those $6 ones; that would have promoted quicker healing. The day after what I determined was a food poisoning attack, I succumbed to the darkness, the darkness that was Space Mountain, and this guy. Who knew they had a Training Academy here. Had I known you’d be here, I would have dressed up or something. After Tinker Bell fluttered among the fireworks, probably the best I’ve seen, my child beamed at me, “Can we come back?” Of course, how can we not? Next time, I’ll probably drink more water. You’ve given “Splash Mountain” a whole new meaning! Funny thing is, Kylie, I still loved that ride! I don’t recommend on it an upset stomach though. We had a touch of a similar bug last week. I can’t imagine standing in all those lines, in that heat, with those masked madmen, I mean characters, surrounding me while going through that. If lines were too long, we just didn’t go on that ride. You can always fast pass it, but only for one or two rides. You do what you can. Ah yes, Disneyland. We’ve not been there but we’ve been to Disney World. The lines at Magic Kingdom are scary, so it’s nice now that my kids are older that they prefer Epcot Center and Animal Kingdom. Those parks aren’t as crowded. Sorry you upchucked. I’m sure that goes down as one of your most proud moments. 😉 But yes, those Disney cleaners are quick. There is no puke left behind, that’s for sure! I hope they get hazard pay. I want to go to Kingdom. Never been! Maybe someday, Carrie. No puke mess…like it never happened. We took the 3 monsters, I mean darlings to Disney a few years ago. We also wanted the younger ones to experience it before they got too old. (Aspie Teen has been there several times in his life time). The fast passes and the apps saved our lives although we almost ended the kids lives ourselves several times. Them and lines are not the best of friends! Superherodad, there was definitely a limit to how long a line we stood in! The fast passes are useful, but only if you get them early enough. Disneyland requires strategic planning, as well as flexibility. I think I have at least a couple more Disneyland trips left in me hopefully. Yes, Ralph, the ride is banished from my blog!! Thanks for the video. The ride looks so different in the daytime, as I went at night when I didn’t want to be wet. It also goes much faster than shown here. Still a fun ride, however. And so I did. I went down that crazy drop, screaming the entire way. Good times, good times! By the way, my hubby and I LOVE the Pirates of Caribbean, too. Anka, did you have your baby yet? If not, be advised, it may come out screaming. Ha! I could not resist. No, kidding! I thought my baby was going to fly out of me. Fortunately, he’s still hanging out in my uterus. Kicking like the karate kid–he’ll definitely come out screaming. Maybe he’ll even have a soccer ball attached to his toes! LoL. Best of luck for a quick delivery of a healthy, screaming bundle of joy! Thank you kindly, Honie! Ten weeks and counting . . .
Only ten more weeks??!! Wow, I can’t believe it. It seems like yesterday when you made your announcement. How are you feeling? I know–time is flying by! I feel so relaxed with this pregnancy. A little too relaxed. I keep telling myself next week . . . Next week, I’ll hit up Babies-r-us and buy all the bottles, onesies, and pacifiers I need. Keep feeling relaxed. I think that’s a very good thing. You’re such a pro at it now I bet! Anka, oh my god!! That’s crazy, sister! Your little bundle of joy is going to be a risk-taker. This is my prediction now! I can’t believe that’s all Disneyland said to you. There was just that one big drop. That’s the thing about these rides at Disneyland. They seems pretty tame, most of them, but then they’ll have a little zinger like that drop! I’m glad you’re okay, miss. Pirates was still great after all these years! It’s too bad my son didn’t like it. Maybe next time. My daughter is eight and she didn’t like Pirates either. She had her head buried in my shoulder the entire time. I say we both give it a few more years. Then our kids will really learn to appreciate the shooting cannon scene! Yeah, maybe. They don’t make rides like this one anymore, that’s for sure. I love the cannon scene! OH! 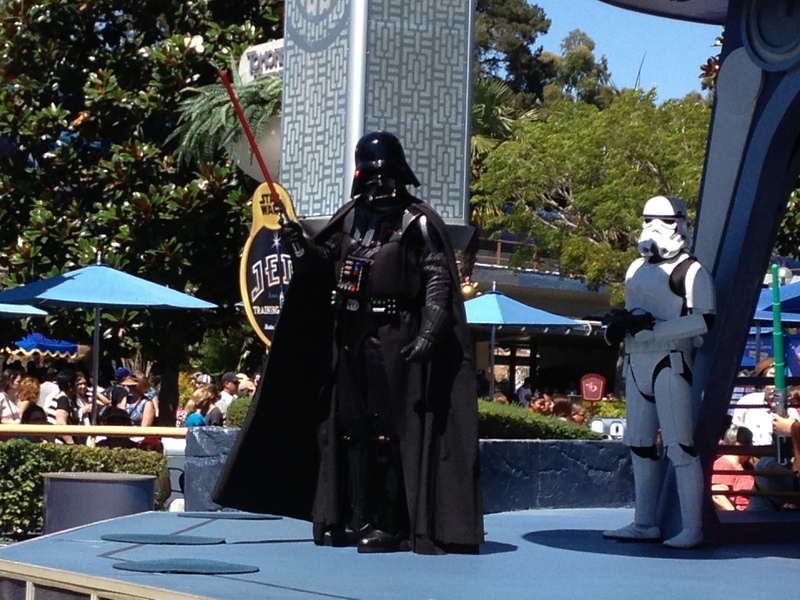 And my kids would have LOVED the whole Star Wars training camp… my 20 year old was mighty tempted. Sounds like a great time (for the most part). I’ve never been to any Disney park, partially because I’ve never been anywhere near one, but also the long lines turn me off. Someday I’ll get there, I’m sure. I bet you would actually love it. The rides are pretty tame, too. The lines are the biggest drawback for sure. The best time to go is when the kids are in school, but then you’re in school too. 🙂 I’m sure you will get there someday. Maybe when I have kids so I can enjoy all the magic through their eyes. I just need to make it down to southern California or Florida. Ah, right! They don’t have one in South Korea? Definitely more of a purpose with kids, although you see plenty of couples, even brides. Lots of people like to spend their birthday at Disneyland. They get a button. There is one in France, Tokyo and Hong Kong; the only ones outside the States. It’d be interesting to go to all of them and see the differences. When I was almost six, my grandparents lived in Riverside, CA. My sister and I flew out to visit. I have the most vivid memories of Disneyland. 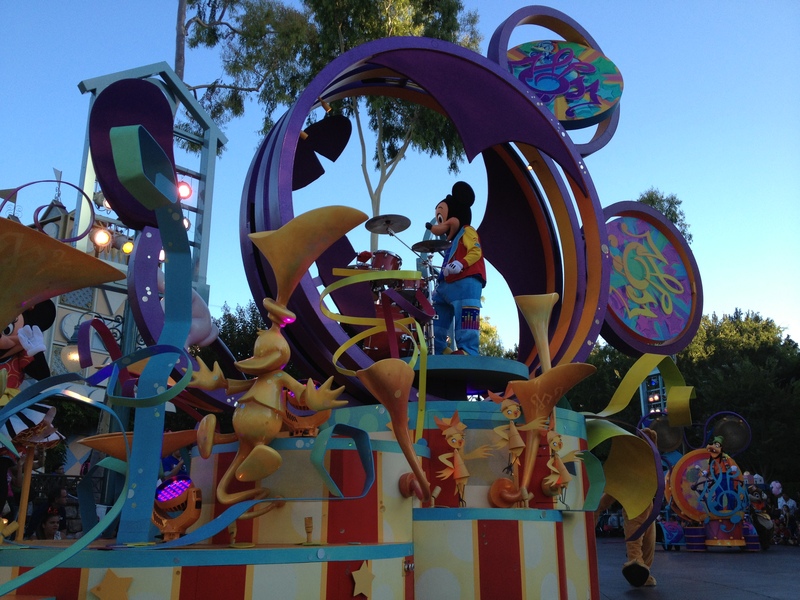 Wonderful gleeful snapshots of the Small world and the haunted house ride with my Grandpa. And being at the front of that log flume when my little red dress with white polka dots got soaked through. Glad you made it happen for them Amy. Oh, you still remember your dress! Oh, how sweet. My memory is not as vivid, but I do recall having a wonderful time, enjoying the Pirates and It’s a Small World most of all. My family lived near Riverside, by the way, so we weren’t far from Disneyland. Thanks, I’m glad they got to go. It’s not as simple as it was then! I was almost 40 when my girl took me to Disneyworld for the first time. And as soon as I saw Epcot in the distance, I was instantly a 5 year old. Awesome!! I still haven’t been to Disneyworld. That is on my list! If you know how to scuba, you can get a tour behind the scenes at the aquarium (fascinating), and then dive in their tank (mind blowing!!!). Wow!! Did you do that?! I don’t scuba, but always wanted to. Wow, Guapo, you do it up right!!! And even worth the early hour I had to be up at to go. That’s very cool. I daresay it sounds magical! It has been a long time since I have been there but I remember having a great time. No throwing up kind of fun but it was great anyway. I’ll never forget the throwing up part. Hopefully, my kids will. It is a great place! We will go again someday, hopefully.